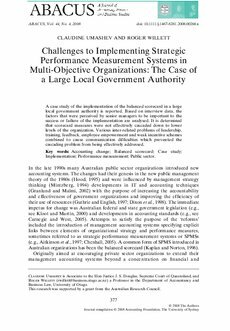 A case study of the implementation of the balanced scorecard in a large local government authority is reported. Based on interview data, the factors that were perceived by senior managers to be important to the success or failure of the implementation are analysed. It is determined that scorecard measures were not effectively cascaded down to lower levels of the organization. Various inter-related problems of leadership, training, feedback, employee empowerment and weak incentive schemes combined to cause communication difficulties which prevented the cascading problem from being effectively addressed.